A timing belt is the ribbed belt that is placed in a specific configuration along one side of your engine to keep the crank and camshafts timed properly. 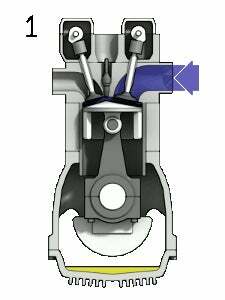 Essentially, it keeps the top half of the engine (cylinder head, valves) in sync with the bottom half (crankcase, pistons). 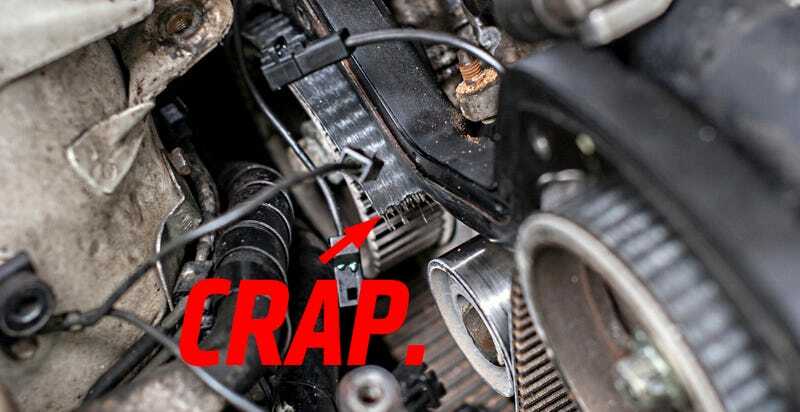 If you have an older car from the 90s and below, odds are you have a timing belt. Some new car manufacturers, such as Audi, still use timing belts in their engine designs, but for longevity, many manufacturers have switched to metal timing chains that in theory last for the life of the engine. My advice would be to refer to your owner's manual and look up the maintenance schedule. If you don't have one, Google it. If you don't see a timing belt service listed, you have a timing chain. You can also check here to see if your car is on the list of cars with timing belts. Manufacturers employ various schedules and measures for timing belt replacement, but the rule of thumb is 60,000 miles, or 5 years, whichever comes first. Is My Engine Safe If My Timing Belt Snaps? Well, that depends. There are two types of engine timing configurations: interference, and non-interference. An interference type engine means that the valve's stroke and piston's stroke take up the same space in the cylinder, so the timing belt essentially keeps them from smashing into each other, since they do it at different times. If the timing belt snaps, they run into each other, causing bent valves (most common), cylinder head or camshaft damage, and possibly piston and cylinder wall damage. While it is possible that no damage could occur from a snapped belt on an interference engine, such a case is unlikely. In a non-interference engine, the pistons and valves don't occupy the same space, so if the timing belt snaps, no valve or cylinder damage occurs. You just pop a new belt on, and the engine should theoretically drive normally. You can find out if your engine is a non-interference or interference by referring to this list. If your engine isn't listed, Google it, as these lists aren't exhaustive. How Much Does It Cost To Change My Timing Belt? Timing belt services can be costly on some cars, ranging into the thousands of dollars. A typical job would be around $450. If you do it yourself on a car that is relatively forgiving, the parts cost for good quality components would be around $250 or less, so taking a day and doing it yourself would be well worth it. How Do I Change My Timing Belt? As a timing belt is such an integral part, and the maintenance interval is once every half decade, it makes sense not to cheap out on quality. I recommend Gates belts, as they exceed OEM quality and are reasonably priced. Along with the belt, you'll need the timing belt tensioner, pulleys, and water pump. Go with Koyo (if you can) for the pulleys, and Aisin makes great water pumps if you can find them for your model. As a general rule, you get what you pay for. The reason to replace everything else is because since you'll have everything exposed, it's much easier to replace worn components on their way out to avoid problems in the future. In order to get the best purchase on the front lug nuts, engage the parking/emergency brake (if none is available/not working, put a brick behind the back wheel) put your 1/2" breaker bar on the appropriate socket size (usually 17-21mm) and turn counter-clockwise with the car on he ground. Remember, you're loosening, NOT removing. Get the lugs loose enough that you'll be able to take them off with a regular ratchet. Place jack stands underneath the car, rest car on jack stands, making sure that its weight cannot shift. You can now remove the front wheels. After this, you can disconnect the negative battery terminal. Some car have auto-tensioners that you need a ratchet to de-tension, and some cars have a tensioner and lock nut that you can adjust yourself using a socket. This car had an adjuster on the alternator. Simply loosen whatever is giving tension to the belt(s) and remove the accessory belts. The crank pulley, in theory, is supposed to slide right off the crank. This does not always happen, as years of corrosion, and heat cycles have all but welded the pulley onto the crank. Do not pry on the pulley, as this can introduce cracks into the pulley, or worse - the crank. What you need is a 3-pronged pulley puller, grab the pulley from the outside, and use a socket to create tension in the center, allowing the pulley to be pulled out of its space safely. Top Dead Center is the measure at which the timing marks on the crank and cams are aligned. It is the point in the stroke where the #1 cylinder has reached the absolute top of its stroke. At this point, the camshaft sprockets will align with the marks on engine, and the crank sprocket will align with the marks on the engine. Some engines, like GM interference DOHC V6s, will require special tools keep the cams from moving, so consult with a factory service manual if you can. Another way you can check if you're in the right ballpark is to remove the spark plug on the number 1 cylinder and put something long (screwdriver or socket extension) in the chamber and turn the crank pulley with the breaker bar and see where the top of the cylinder's stroke is. Now that the cam and crank are timed correctly, You can take off the timing belt tensioner. The one on the Lexus was held on by 2 12mm bolts. Some are held on by a Hex bolt or single 14mm -17mm socket, and others are hydraulic tensioners that operate on oil pressure. You can now remove the timing belt. Ours snapped while trying to make adjustments, but even if you have an interference engine, you can't do much damage just working on it, damage will only likely occur when the engine is running. The Water Pump on the Lexus was way past serviceable, and it needed replacement, as it was leaking badly. In order to remove the water pump, make sure to drain at least the top half of the engine by draining the radiator from the bottom. Be sure to have a catch pan to get any coolant spillage. The pump comes out with a series of bolts, usually 12-14mm in size. If it doesn't want to come out with no bolts connected, give it a whack with a rubber mallet or small hammer. Remove as much old gasket material as possible with a combination of razor blades and soft metal wire brushes. Then put your new water pump gasket on, with a light layer of high-temp gasket sealant. This is extra protection against casting imperfections. I like to let the gasket material set and become less tacky, that way it forms a better seal against any oils or fluids that may have been left on the surface of the engine. The new timing belt has marks that correspond with the marks on the cam and crank sprockets. Double and triple check their orientation. Don't worry about there being slack in the new belt. Adjust it until you feel no slack in the belt and tighten to spec (refer to factory service manual if you have one). Hydraulic tensioners need no adjustment. Ours was simply put place with 2 12mm bolts. When everything is tight, rotate the crank pulley a few rotations and see if the marks on the cam and crank line up properly on every revolution. Don't worry about lining up the marks on the belt after a few revolutions. The important part is that the crank and cam are in their correct positions. Torque the Crank Pulley with the torque wrench, most cars require a torque rating of at least 100 ft-lbs. As a rule, tension the accessory belts to the point where they can only deflect 90 degrees between pulleys. On this car, I measured deflection between the A/C compressor and crank pulley and tightened the tensioner until I couldn't deflect the belt past 90 degrees. As you drained the radiator when you replaced the water pump, you'll need fresh coolant. Pour a 50/50 mix of antifreeze and distilled water it in the radiator until you see the coolant at the top of the radiator. Then Fill the expansion tank/overflow tank to the appropriate cold fill line, reconnect the negative battery terminal, and start the car. Put the heater on full and get the car up to operating temperature. This should get the air out of the system. Keep an eye on the coolant level for the next few days, adding when necessary. Put back your wheels and lower the car. Job done!